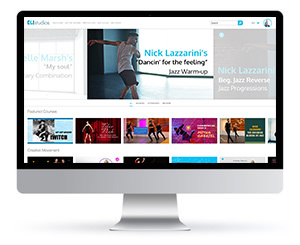 CLI Studios works with over 100 world-renowned choreographers and dance educators to keep your teachers and dancers inspired throughout the year. Our Studio Partnership Program includes hundreds of hours of continuing education videos in every level and style of dance for your entire staff, giving them access to warm-ups, across the floor combinations, choreography, tips and techniques, and music playlists throughout the year. Our Partnership Program also allows you to offer master classes directly to your students from So You Think You Can Dance choreographers through the use of a TV or Projector at your studio. Every week our Members get 2-3 new videos to help with lesson planning, choreography, music selection, and more. The videos never expire, so you can watch them again and again as you prepare for your classes throughout the year. Check out a few of our videos below, featuring three of our amazing educators, tWitch, Julie Kay, and Teddy Forance! CLI Studios co-founder tWitch is one of the most well-known hip-hop choreographers around the world. When tWitch isn't on The Ellen Show or So You Think You Can Dance, he's in the studio with us creating inspiring new videos for our Partner Studios around the world. In this video, tWitch will teach you the basics of "down grooves" by explaining the mechanics of the movement, and then putting together the basics in a combination your teachers can use in class! Develop Your Creative Movement Program with Julie Kay! Teaching young dancers the basics of movement is one of the most important aspects of running your studio. It's the first step in the process of creating the next generation of amazing dancers but can be tough to keep fresh, inspiring, and fun. That's why CLI Studios has partnered with Julie Kay Stallcup, providing you with great tips and techniques for teaching younger dancers every month. When you join the CLI Studios Partnership Program, you get access to Julie Kay's resources and more! In this video, join Julie as she guides you through a jazz syllabus for your beginner dancers. Take on various pivot turns, the box step, lindy hops, and more as she demonstrates effective teaching techniques with the help of four young dancers. With over 250 hours of specially curated content, combo classes of various styles and levels, make up a big part of CLI Studios programming. Teddy Forance (co-founder) has contributed many challenging contemporary classes that you can either put up on a projector for your students or use to prep for your classes ahead of time. Teddy started his professional career at just 17 years old and some of his credits include: Celine Dion’s Taking Chances Tour, Cirque du Soleil’s Delerium, Lady Gaga, Janet Jackson, Usher and Florence and the Machine. In this video, Teddy asks you to take your time and let you body settle within the choreography. As the music builds, reflect this through more expansive and full-body movements. To learn more about CLI Studios, reach out to your Partnership Program Associate or click the link below!